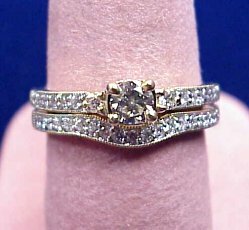 This is a very nice diamond band containing 9 round brilliant cut diamonds of G-H Color, SI Clarity, 0.33CT TW. 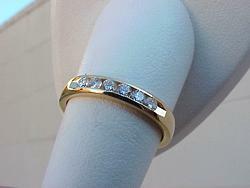 The diamonds are bezel set, very secure, no prongs and a low profile and beautifully set in 18K. 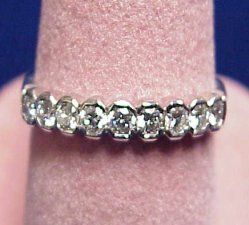 This popular ring comes with 0.10CT TW of lovely round brilliant cut diamonds each of G Color, SI1 Clarity, channel set in 14KW gold! A wonderful buy at .. 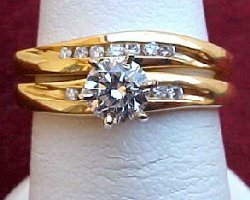 This beauty comes with 0.25CT TW of round brilliant cut diamonds each of F Color, SI1 Clarity, channel set in popular 18K gold. A terrific ring at a great price! 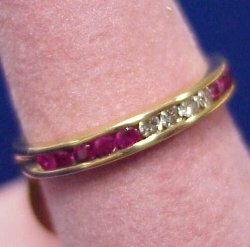 0.20CT TW of rubies and 0.08CT TW of diamonds make up this striking anniversary band. 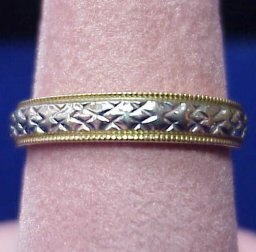 Take pleasure in this elegant two-tone 14K engraved wedding band. The outside edge is milgrained to add to the beauty of this piece. 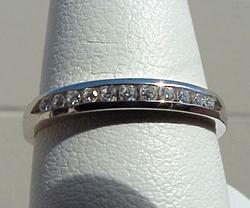 14K Rose gold and diamond eternity band, set with 15 - 1.5mm (0.30CT TW) round brilliant cut diamonds. 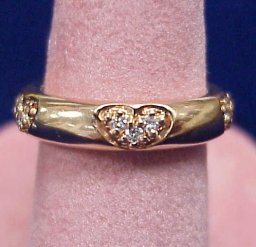 (3 diamond heart design).